A while back I told you about a tiny house community dedicated to homeless people in Olympia, WA called Quixote Village. 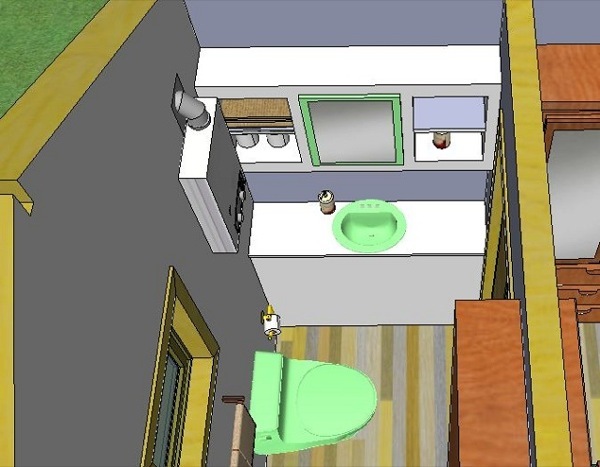 As a part of LaMar Alexander’s Off Grid Tiny House Design Contest for 2014 a contestant submitted a design inspired by the affordable tiny homes at Quixote Village. The village consists of 30 tiny cottages. And it all started out as a tent camp for the homeless. Today there’s a vegetable garden and community building with showers, laundry facilities, communal kitchen, dining space, and more. 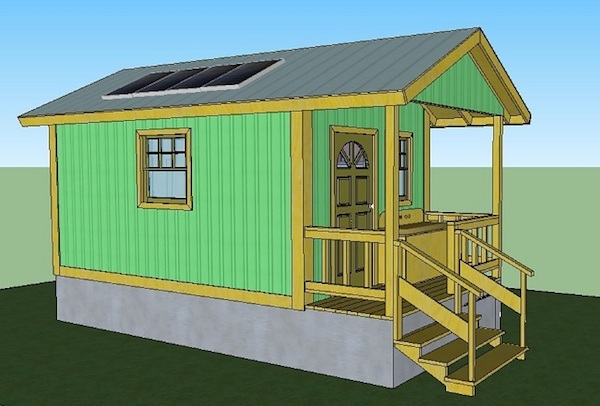 Can be stick built or built using SIPs (structurally insulated panels). More info available here. Visit Quixote Village’s website here. 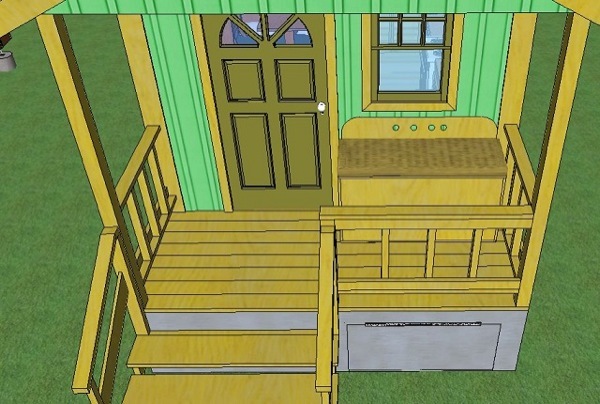 I like the illustrations… Easy to grasp what the finished Tiny House will be. Very nice!! A great little home with everything you need. This would be a far better for trailer towing vs those with lofts too as 2′ lower or so. For myself I’d rather have a bath in half the room, 2.5’x3′ I’m using now and never touch the walls unless I want to for balance. 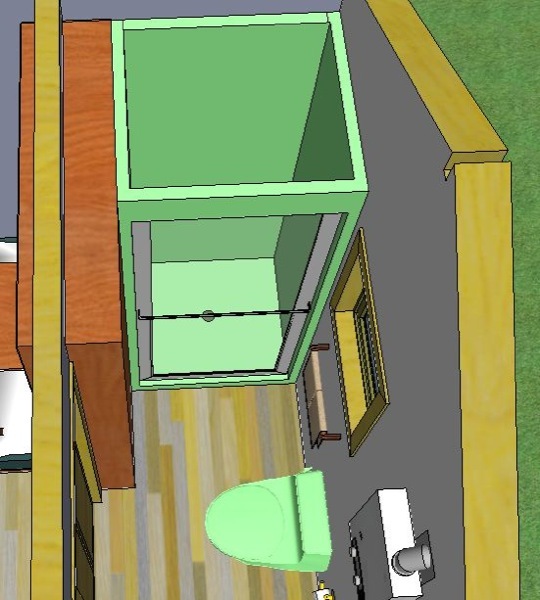 Then use the saved room for storage. One comment on the inverter/ electronics should be mounted higher on a wall arranged so the air naturally flows up the fins by convection plus fresh cooling air. Mounted flat on the floor is bad for cooling and easier to get wet so higher up with the fins going up is the correct way. It’s a main reason they die, from overheating. This goes for all power electronics mount them according to directions or it’ll become rather costly. If in doubt get a low power computer type fan blowing on them and keep sun off them or the wall they are mounted on. Too cool for words! Happy to see this, and hope we can see this elsewhere in our country. I agree with Jerry D its awesome. OK, I’m nitpicking… why, oh why, store the gas bottles on the porch? Wastes valuable porch space and should be stored on side of the house where the kitchen is so it feeds directly to the stove. I too liked the diagrams. Much easier to really see the space. I have had two mini refrigerators and they didn’t do a good job of freezing (ie. ice cream too soft). Do these work better? Is this one gas? I think instead of a desk, a full wall of cubes would be nice. Lots more storage. I would do paper work or be on the computer at the table. It would give more room for at least one comfortable chair. For the TV I would like one on a arm that you could pull out and swivel. Or put up a shelf so it could be moved. Is there enough room in the bathroom for a stackable washer and dryer if the sink and cabinets were smaller? Where does the table and chairs go when the bed is pulled down? What runs on electric and what is gas? Is the heat register really next to the oven? Also are the cabinets in tiny houses standard size? They don’t seem to be as deep. Compact Appliance sells under-counter combination washer/dryer units. They’re online. In a small space, I prefer a span of windows across the kitchen counter. Just wanted to make a correction: this Quixote design was not entered into the contest and is one of my designs still in progress. It was inspired by the houses being built for the homeless in Quixote village but is slightly larger with 2×6 walls and 2×8 floor for better insulation and designed for off-grid use. The interior layout is completely optional and this is just one layout design I came up with. I will be including more layout designs and a framing plan with approximate material costs and options for foundations and additions with the final plans. The contest is still open and runs until the end of January so please do come by and check it out. Great prizes and we would love to see your designs! I like the lay out well. Not sure I would opt for so much kitchen taking up the space, but it looks very useful. 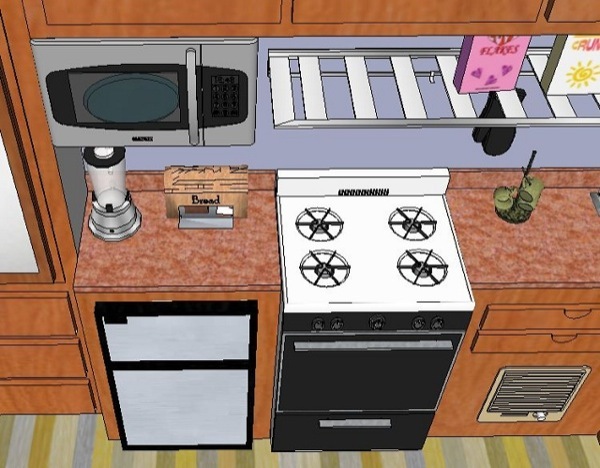 I appreciate at least a 21″ stove to cook on and a non college style fridge. I hear ERV’s are not best for my climate in the PNW. What might be best to feed and exhaust air in a space this size? Affordable means? I have to be honest. The floorplan/layout is terrible. There is no room to function or even walk around or “be” in this design. Is this like a “safe room” or a “fall-out bunker”? It looks like some kind of doomsday prepper emergency shelter, not a real place to live. And the exterior, architecturally speaking, has just about NO aesthetic appeal. They look awful and uninviting. Sorry. Try a lower corner carousel cabinet in the kitchen. It easily stores a set of stackable kitchenware, a utensil basket and dry goods. Additional cupboards may not be needed. Arched windows on the peaked walls may provide more light. To save space in a bathroom, try a small 12-inch corner sink without a vanity. Store towels and cosmetic baskets on narrow shelving over the toilet. Hang clothing or towels on hooks. I too liked the diagrams, they are easy on the eyes. Maybe the bed could be a Murphy bed. This would give more space to move around when it is closed. A lot of thought has gone into this design. Thanks for sharing. Cheers from Australia. Very well thought out and put together, For the tiny space . There is nothing I would change.. Also not having the ladder only sleeping loft is another plus..